List Rules Vote up the crafts a four-year-old would dive right into. Four year olds are filled with energy, laughter, and the need to express creativity. This list of good crafts for 4 year olds is filled with crafts that easy, fun, and educational crafts for four year olds that will keep them laughing and learning as they create! This list is filled with unique and awesome craft ideas and activities for four year olds. Your four year old will have so much fun creating art from bubbles, making stamps out of nuts and bolts, painting the clouds, and leaving their handprints on canvas - instead of the wall. They'll learn about the wind while you create colorful, spinning pinwheels, and practice fine motor skills by applying watercolor paint to canvas with the aid of an eye-dropper. For most of these arts and crafts for 4 year olds all you need are things you can find around the house: paper towels, markers, dish soap, nuts and bolts, and yarn. From there, all you need is a little bit of time and a lot of laughter and creativity! Check out this list of good crafts for 4 year olds, then it's time to get creating! Upvote the crafts that bring out the biggest smiles on your four year old's face! Want fun crafts in your mailbox every month? 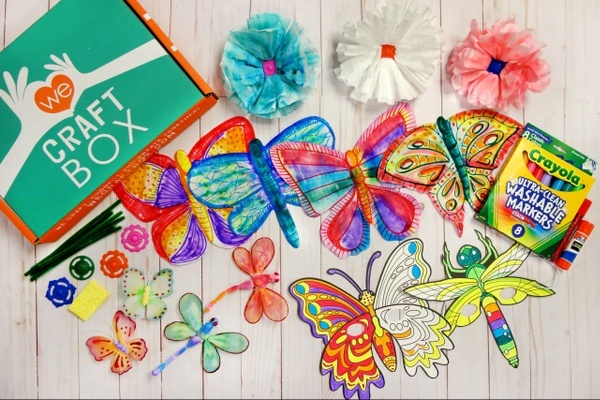 Sign up for the We Craft Box and get 2-3 crafts complete with materials and photo instructions from $25/month. You can use toilet paper rolls or left over cardboard rolls from Christmas gift wrap as Learning 4 Kids suggests. Cut the edges, then just dip and stamp! This isa little on the advanced side, but your four year old will love learning about the wind as you work together to create this pinwheel craft from Childhood 101. After cutting the foam into smaller pieces, it's up to your 4 year old to create a masterpiece. All they have to do is attach the pieces to a larger piece of cardboard. The Craft Train suggests mixing paint with the glue you use to adhere the foam pieces to the cardboard piece. Dish soap, food coloring, a piece of paper, and a straw are all you need for this craft from Housing a Forest. Have your kids blow the bubbles and simply lay the piece of paper onto them so the paper absorbs the food coloring.